Alvery Smith, 51, of Contant Towers appeared in court Monday morning, April 10, 2017 for a change-of-plea hearing and stood before USVI Superior Court Judge Kathleen Mackay to formally admit to the crime. Mr Smith faced four charges – grand larceny, embezzlement by fiduciary, embezzlement by employee and uttering a forged handwriting – in connection with the crime, but rather than face a jury, he accepted the terms of a plea agreement. 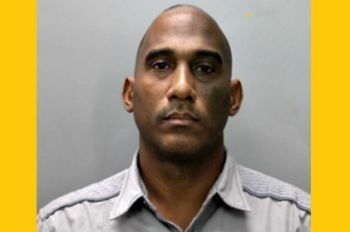 Under the terms of the plea deal, Mr Smith pleaded guilty to the single charge of grand larceny and the remaining counts against him were dismissed. The plea bargain also requires Mr Smith to pay restitution to MoneyGram in the amount of $850,000; to be placed on probation for a period of six years; and to complete 100 hours of community service for each probationary year. Judge Mackay accepted the guilty plea and has set May 26 as the date for Mr Smith’s sentencing as she awaits a pre-sentence report. Smith was taken into custody on November 25, 2015, by officers from the Economic Crime Unit who executed an arrest warrant on him after investigations revealed that he purloined $1,413,908.02 from MoneyGram. At the time, Smith owned A&C Xpress Corporation, which was a licensed agent of MoneyGram, and operated six locations within the territory. Mr Smith remains on bail pending his sentencing. The case was prosecuted by Assistant Attorney General John Tolud. Tis man was made a comment of about ppl going with people stuff and look at the news he's on!!! boy the world really round!! !